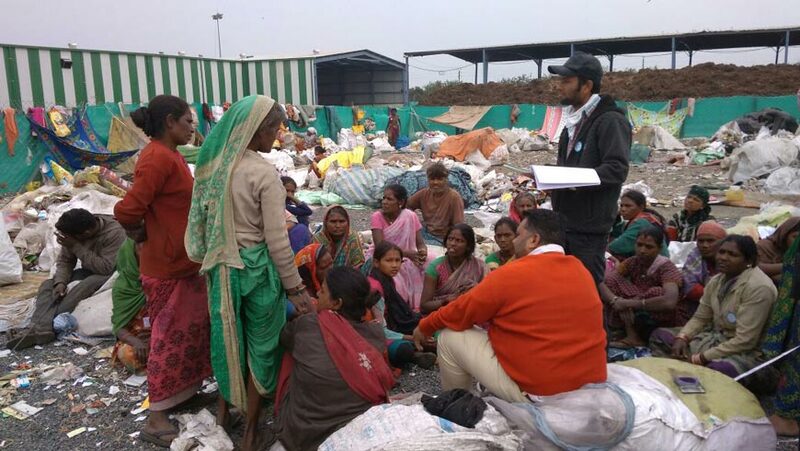 A GEF Small Grants Programme project in Bhopal, India has provided technical and financial assistance to waste pickers, mostly women, with the aim of improving their living conditions while protecting the local environment. Bhopal, known as the City of Lakes, in Central India, is home to approximately 2 million people. Every day, this city generates about 480 to 500 tonnes of waste, a problem exacerbated by rapid population growth and industrialisation. Fourteen percent of this waste was dumped at Bhanpur Kanti, a wasteland north of the city centre covering 30 acres, where it was sorted by about 2,000 unorganized waste pickers. These waste pickers, of which about 85% are women, work under tough conditions and are frequently shunned and chased off. To address this problem, a local NGO called Sarthak sought technical and financial help from the GEF Small Grants Programme, implemented by UNDP to improve the living conditions of the waste pickers, also known as Sarthak Karmis. In addition, SGP connected the local NGO with the Bhopal Municipal Corporation (BMC), who agreed to allocate 5000 square feet of land to the NGO Sarthak, as a place where Sarthak Karmis could set up waste segregation centres. With the aim to systematize waste collection, recycle plastic waste, protect the local environment, and provide waste pickers with a secure source of income, NGO Sarthak organized about 1665 waste pickers into 23 self-help groups in 5 of the 70 urban wards of Bhopal city. With support from BMC, the self-help groups assisted the waste pickers in accessing social security services such as insurance, food stamps, and pension cards. A saving scheme was also established to allow waste pickers to set aside a portion of their salary. Another benefit for the women, is that by earning a decent wage, they are now able to provide support to their families and can afford to pay for an education for their children. To consolidate the initial results of this endeavour, the NGO and the self-help groups established a sustainable business venture for the collection and sorting of plastic waste. The business model revolves around bringing the collected waste to the segregation centres, where it is sorted by different types of waste. The collected plastic waste is pressed into more manageable bales that weigh 100 kilograms each by use of a compactor. The bales are then sold to 12 local cement manufacturers. 85% of Bhopal's waste pickers are women who work daily in harsh conditions. Thanks to the project, these women have been able to form self-help groups, secure their incomes, and access social services that were previously not available to them. "I have been engaging in collecting garbage from the wards of Bhopal Municipality for the last 30 years. Initially we were earning about 70 cents of a dollar in a day. Through the interventions of the GEF Small Grant Programme implemented by Sarthak, we are now recognized for the work that we do,” said Ms. Mala, a waste picker from Bhopal. By collecting and selling plastic waste to the smart segregation and reprocessing centers established by Sarthak and the Bhopal Municipal Corporation, we earn up to US$6-8 in a day, which allows us to send our children to school and pay rent for a place to stay." The Sarthak Karmis are also contributing to an innovative new waste management methodology. By selling the recycled plastic to cement manufacturers, who use it as refuse derived fuel for their cement kilns, the waste pickers’ initiative saves on greenhouse gas emissions both by avoiding open burning and by the fact that refuse derived fuel does not release persistent organic pollutants during combustion. Given their success, in 2011, the Sarthak NGO was asked to replicate the Bhopal model in Indore. With support from GEF SGP, a pilot plastic recovery centre was established in Papliyapala, Indore in 2014. This center registered nearly 1,100 Sarthak Karmis, who were given a series of trainings on waste management, capacity building exercises, and the same support to access social security services as in Bhopal. At the Indore center, the NGO collaborated with the Office of the Municipal Commissioner and the Indore Municipal Corporation (IMC) to install a high-pressure air cleaning machine which uses air to remove dust and muck from waste polyethylene. This waste is then shredded to be used to build roads as per the Centre for Road Research, Government of India guidelines. Other kinds of plastic wastes are also collected, compressed into bales, and sent to local cement plants to be used as fuel. Thanks to the establishment of the centre, the Sarthak Karmis’ daily income has quadrupled. NGO Sarthak has been recognized with several awards for their efforts in the field of sustainable plastic management, among them the EARTHDAY Award in 2017 and the Earth Care Award in 2018. Their work to ensure the sustainability of Bhopal and Indore continues and UNDP has plans to scale up pilot centers in 50 selected cities in India, across a range of States.